Your customers have a lot of questions and expect fast responses. With LiveChat on your site, you can finally answer all the queries and build a long-standing relationship with them. WebSite X5 is an all-in-one website builder that helps to design, build and deploy corporate websites, responsive online shops, and blogs. The solution is intuitive (you don’t need to have coding skills) and lets you make use of a handy drag & drop editor. Choose one of the ready-made templates, quickly create a blog and benefit from SEO optimization. What’s more, WebSite X5 comes with a set of e-commerce features so you can create a product catalog, set up multiple payment methods(PayPal, credit cards, bank transfers or cash on delivery) or apply discount & coupons with fixed percentages. You can send transactional emails and set up an automatic notification for your users. The software will also help to manage stock availability; you will easily track your sales or check incoming orders. This will help you control supplies and make sure your products are always available for customers. With just a few easy steps you can add LiveChat to your WebSite X5 site. All of that by simply copying and pasting your LiveChat snippet. Check our tutorial and see how easy it is to provide your customers with immediate help! With LiveChat you can make sure that your chat window will match your website's design, creating a seamless experience for your customers. What's more, with a little bit of CSS magic, you can make sure that the chat window will look exactly like you want it to – all of that without changing the code of your website. 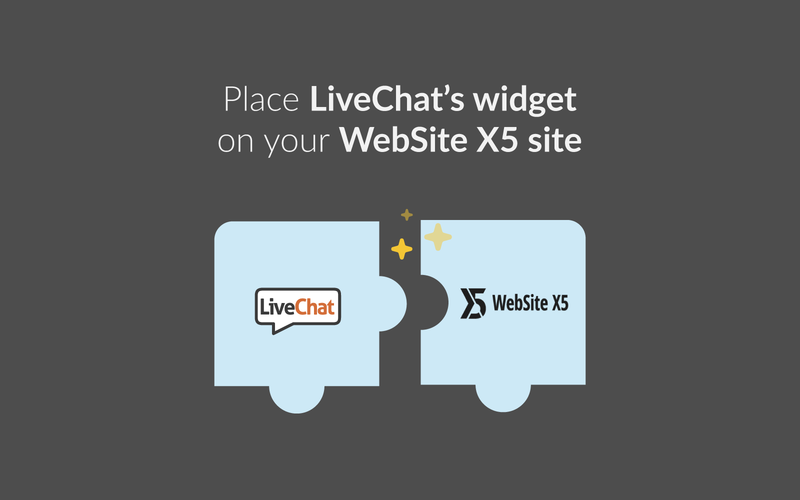 Start using LiveChat with WebSite X5 now!